I love cool taupe grey colours. ∗It’s Monday! What Are You Reading? The Little Shop of Found Things by Paula Brackston. I had a wicked stomach ache last night but it’s my fault for eating too many Rice Krispie treats. Gosh, when will I ever learn. It’s detrimental to only have one. I am back to normal feeling better today and even went for a workout at the fitness center. Go me! I’m working on the Christmas Readathon as well as Countdown to Halloween. Next month I will also be posting 13 days in Blogoween and Fraterfest October 11th- 16th. Both events are also linked in the sidebar at the bottom of my page. I will be taking part in Jennifer Estep’s Kill the Queen Blog Tour and Giveaway happening this week. My post will be up Monday on Jackie’s Bookbytes. Well, that’s all for this week. It’s fall Y’all. Be good. Yay for October is coming! I love October! Probably my favorite month in the blogosphere too, with all the Halloween stuff. Yay! My birthday is on October 4th. Little Shop of Found Things sounds amazing 🙂 and that cover is super cute too! Seems like October is going to be quite busy for you 🙂 All the best with all the readathons. little Shop of Found Things looks really cool. I hope you enjoy it. Enjoy your week…and your birthday. Thanks for visiting my blog. I’ve heard really good things about Jim Butcher even though I’ve personally never read anything by him. Jim Butcher’s Dresden Files are super duper. I hope you get to read them. I love the Dresden Files books although I’ve only read the first 4 and I’m pretty sure I have a copy of Under the Hat somewhere. Looks like you have some great atmospheric reads for this time of year. October is my favorite month! I love cold weather and spooky stuff. Have a great week! Enjoy your new books! Jim Butcher and Ilona Andrews are favorite authors of mine. I hope you enjoy their books. Come see my week here. Happy reading! The Dresden Files are amazing – another series I need to finish! The Little Shop of Found Things sounds good as well. Damn those Rice Krispies. But we can not stop with one right? Little Shop of Found Things souds super cool! Wow you’re going to be super busy with all the holiday read-athon! I recently got festive with buying Halloween paper plates and napkins but not holiday themed books. I guess I can pick up a vampire book and it will be my Halloween book? 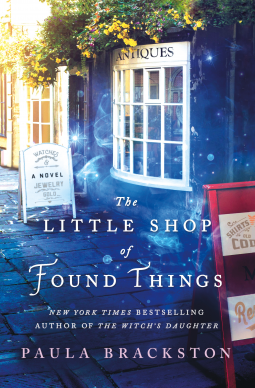 I love the cute cover of Little Shop of Found Things. I’ve only read the Hidden Legacy series by Ilona Andrews, but I love it! I can’t wait for Diamond Fire! I have the audio for the first book in the Magic Bites series, but I haven’t had a chance to read it yet.